The Apex Radio 303WA-2 is a quality passive receiving antenna (not for transmit) providing coverage from 30 kHz to 30 MHz. The antenna is designed for areas where space is a problem or when an unobtrusive installation is essential. The small size and relatively light-weight design is ideal for installation in a confined space such as apartment balcony. Since the 303WA-2 is passive, it provides superior low noise performance, free of cross and inter-modulations. The 303WA-2 has a "U" bolt metal fitting that will require a short stub mast (not supplied). The mast diameter can be 10-50mm (0.4 to 1.9 inches). 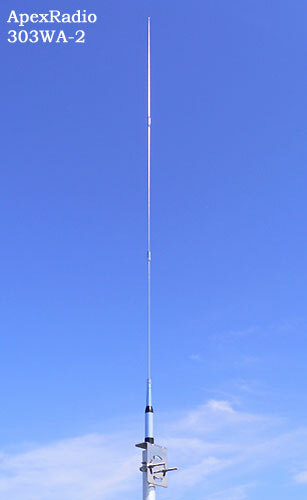 The antenna has a total height of 6 feet (1.80m) in three sections. It comes with a preassembled 10 m (30 feet) length of cable with a M (PL259) plug to connect to the antenna base and a BNC plug for your radio receiver. Click here to view 303WA-2 Japanese/English Instruction Sheet [PDF 381K].